Titanium Dioxide (5%) and Zinc Oxide (5%). Alumina, C12-15 alkyl benzoate, caprylic/capric triglyceride, cetearyl isononanoate, cetyl alcohol, isopropyl titanium triisostearate/triethoxycaprylylsilane crosspolymer, magnesium sulfate, methylpropanediol, PEG-12 dimethicone, PEG-30 dipolyhydroxystearate, phenyl trimethicone, polyethylene, polyhydroxystearic acid, purified water, sodium ascorbyl phosphate, stearyl dimethicone, tetrasodium EDTA, tocopheryl acetate, triethoxycaprylylsilane. Zinc oxide is a kind ingredient to acne-prone skin Thick and goopy Too white Hard to apply and does not mix well with moisturizer I like trying any new "vanishing" zinc-based sunscreen, so I tried this. I did not like it. I found it to be thick and goopy in consistency. It also does not disappear as well as other zinc-based sunscreens I have tried, and is hard to mix with other moisturizer. 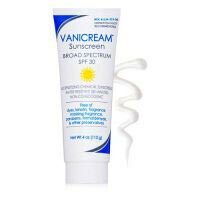 While it is less expensive, it is far inferior to Philosophy Hope In A Jar Oil Free SPF 30 (my favorite zinc-based sunscreen).